Popcorn Trivia, available for iPhone and iPad through the Apple iTunes App Store, is a great app for movie buffs everywhere. If you are looking for a trivia, or quiz based app that has a laser-like focus on movies, then you just cannot go wrong with this. Plenty of questions, modes and features, as well as a weekly refresh of new questions means that you will probably never get bored with this, as long as the developer continues to actively support the service. The strapline of the app reads: ‘Taking movie night to a whole new level’, so that is what I have done for the last few nights, used the app to enhance movie nights. We looked through the app, found a movie we liked and then created a quiz based on the movie. Before we tackled the quiz we sat and watched the film(note: not through the app, but Netflix) and then attempted to answer the questions. It was good fun, especially with a beer or two and is something that we plan to do again in the future. 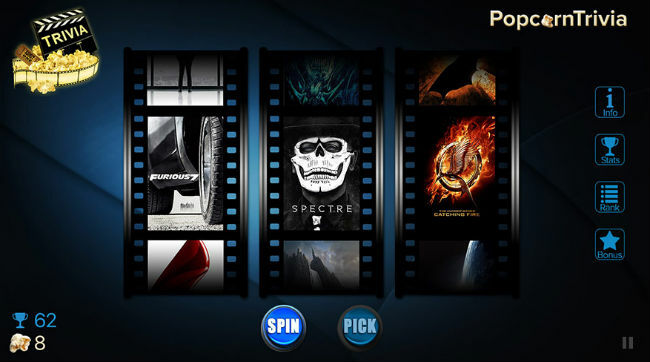 – Choose from a wide range of movies across all genres. – Challenging questions that test your film knowledge. 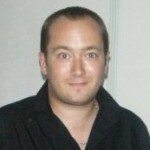 – Questions are cleverly crafted by true cinephiles. – Encounter a wide variety of questions. – Great at parties or on your own. – New movies added weekly. 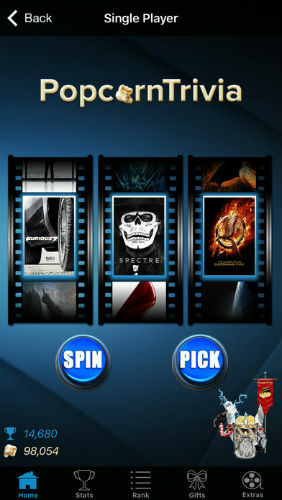 – Answers offer trivia bits about your favorite movies. The first thing you need to know about this game is that is really is a class above the competition in terms of presentation, ideas and effort. There are animations everywhere, from the title screen to nearly every transition, adding a touch of class to proceedings, and the questions have all clearly had a lot of thought put into them, with some having music and sound effects playing, as well as trivia displayed with web links if you want to find more out about the answer. It genuinely feels as if the question makers have carefully, and personally picked through each movie, creating beautiful custom question sets with unique images, music and deep trivia. Blasting through a 10 question set might only take a few minutes, but it is pretty clear that hours went into the creation of each set. There are single player modes, online modes and even the ability to vote on what movie the creators should feature next. With online leaderboards, and the ability to see what percentage of answers other players went for, it does start to feel like a proper community app, and i really hope that the developer doubles down on this aspect in the future. I am struggling to find any real fault here, and so I am happy to give this a great score. If you have even a passing interest in movie trivia, then consider this an essential download.